Also known as Lucania, Basilicata is one of the least visited regions in Italy, whether for lack of knowledge or much in the way of a sea coast. But those who do choose to visit this territory, harsh yet cosy, are in for all together different Italian experience, getting to know a fascinating culture and its centuries-old customs. Wedged between Calabria, Campania and Apulia, Basilicata lies along a narrow strip of land that stretches from the hinterland of the Apennines to the sea. Mostly mountainous and hilly, the typical landscape of Lucania consists of sprawling cornfields and steep cliff faces, invariably dotted with precariously perched villages. Many of them, permeated by a sense of abandonment and mystery, have the charm of an unchanging past. Basilicata has much to offer to anyone who is willing to spend a little time exploring the vestiges of the past. The rural region still clings tightly to religion, as well as ancient traditions and festivals that have been repeated the same way for generations, a fact which makes it one of the warmest places you'll find in this already hospitable country. Snubbed by mass tourism, it also offers the opportunity for a peaceful escape away from the crowds, discovering unique places. Basilicata is above all full of attractions, which will satisfy the thirst for travel and adventure of all visitors. If you head inland, Basilicata's landscape is mostly mountainous. The Apennines rise steeply in the west of the region, with peaks that can exceed 2,000m. Heading east the mountains gradually give way to gentle rolling hills, while to the south-west the landscape becomes flatter. In this flatter area of Basilicata, the land is bordered by the waters of two seas, the Ionian and the Tyrrhenian Sea, and fades slowly into long stretches of beach, formed of fine golden sand. 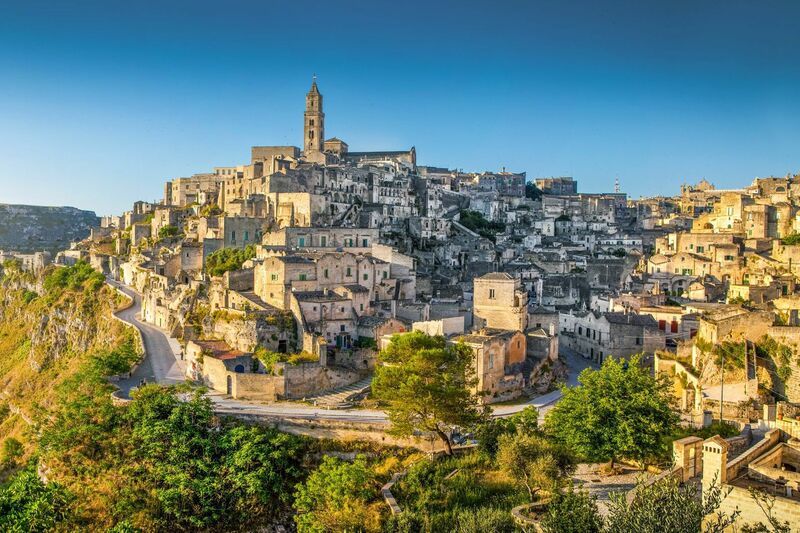 The most important city in the region, Matera, is known for being one of the oldest inhabited cities in the world and its charming old town is well worth a visit. Made up of 'Sassi', buildings carved directly into the rock, the old town has earned Matera the nickname of "la Città Sotterranea" (the Subterranean City). The Sassi of Matera were given a spot on the UNESCO World Heritage list in 1993 and represent a real opportunity to delve into the past of the city, built and worked upon by various civilizations and settlers who arrived in Basilicata, from the prehistoric period up to contemporary . Basilicata is known for its isolation from the rest of the country, and communication can be minimal even between neighbouring villages. Whilst travel can be difficult if you don't have a car, this lack of movement has actually led to a strong preservation of traditions and a wonderfully unique culture when it comes to food and drink. So, let yourselves be enthralled, the local population will invariably welcome you warmly, with offers of local wine or really delicious food, always in huge quantities. You can't deny the beauty of this land! Mystery lovers need to make their first stop in the region Craco, one of the most famous ghost towns of Italy, about 54 km from Matera. Located at the foot of the Appennines, it was abandoned in the early sixties, after a large-scale landslide led to the evacuation of the entire population. Since then, Craco has become a veritable ghost town, exciting travellers for several decades now, along with numerous directors who have chosen this village to shoot scenes of their films. Although the beaches of Maratea, the small strip of coast on Basilicata's western front, are of rare beauty, the region's hinterland remains its most attractive offering. Its narrow roads with hairpin bends will delight motorcyclists. Once you've taken on the curves of Maratea coast (to avoid during the summer months as it becomes vastly overcrowded), take one of the region's classic motoring circuits towards Matera, by passing between the Appennines and the Dolomites. Lovers of nature and wild landscapes will not want to miss Pollino National Park, divided in half between the region of Basilicata and Calabria. The landscape is extremely diverse and passes from snowy Appenine peaks to deep ravines, including forests of trees and expanses of flowering fields. You can also find animals belonging to protected species such as the Apennine wolf, deer, wild cat, otter and various birds of prey. The park allows trekkers to organise day trips, on foot or on horseback. In winter you can enjoy cross-country skiing, in the midst of Pollino's beautiful open spaces. The San Rocco Festival takes place between 14 and August 21 of each year in honour of the saint in Montescaglioso, in the province of Matera. Religious ceremony (with a procession) and folk festival merge into one, as festivals so often do in southern Italy. After a solemn mass in the morning, a statue of the saint is carried on shoulders by devotees through the picturesque streets of the old town and onto the main streets of the city. At dusk, it is placed on a papier-maché chariot pulled by seven horses and runs through the city streets to a cheering crowd. Once night falls, the statue, now in the main square, is finally brought to the church that bears his name, to be worshipped and prayed over. In addition to San Rocco, certain towns in Basilicata also keep up the tradition known as "Maggio di Accettatura". Villagers still celebrate the ancient ritual for newlyweds, which involves looking for a type of holly (called "cima") with a particularly straight shaft. 'Cima' bears particularly copious amounts of fruit and has come to symbolize the fertility of nature. Every year on January 16 the town of San Mauro Forte celebrates Carnival with a spontaneous parade of cowbell players. Several teams of bell bearers parade through the streets of the village to the noisy sound of the bells. The festival of ancient origin, linked to the cult of Saint Anthony, is hoped to bring relief from ailments and abundance of crops. The closing of the carnival is celebrated with the burning of a puppet burned in the town square. Although much of Basilicata is mountainous and therefore not especially well suited to agriculture, the cultivation of cereal crops is relatively widespread. Local cuisine is therefore based on pasta, which is made in different shapes with different thicknesses in each town. Tapparelle, manate, firricieddi, rascatielli, and purcedduzz are just a few examples of the thousands of types of pasta that the women of Basilicata still make by hand, as dictated by tradition. The combination of flours ground from chickpeas, pulses, durum wheat, broad beans, and barley is used to make a dish that is typical of Fardella, Teana, and Calvera. Some of the region's restaurants delight their guests with recipes of this kind. However, the best way to taste all these varieties of pasta is perhaps to go to the festivals that are organised in various villages throughout the summer. 'Lucanica' (or 'Luganega') is a pork-based sausage common throughout Europe. As its name suggests, it comes from the district of Lucania. Other types of sausage are also produced by small companies throughout Basilicata. Herbs and spices are added to the cooked meats to infuse them with original flavours. Bread remains a staple food in Basilicata cuisine and is traditionally mixed with wheat flour, salt and growing (natural yeast dough). It is cut to various sizes and often cooked in wood-fired ovens. Typical, especially in winter and in particular in some areas, of the region is a dish referred to as "baked bread", consisting of onion soup, hot pepper and egg, which is then poured onto slices of toasted bread and grilled. A visit to the territory of Lucania is not complete without buying up some of the tasty local products. Some local specialties to look out for are Filiano pecorino, red Rotonda aubergines, local extra virgin olive oil, canestrato cheese or one of the region's many fine wines. If you want something a little longer lasting, Basilicata still has plenty of options. Since there are numerous artisans and craftsmen based in the area, you'll invariably find unique and extremely well made gifts in each small village you visit. Traditional craftsmanship is a point of Lucan pride, and you'll find plenty of homeware to take home: arved objects in wood, copper braziers and Paoli, terracotta vases, lace and embroidery and even bagpipes, produced in Viggiano.